Apologies for the Richard Whiteley-style headline and the rather gruesome photograph, but if Mary Portas was looking for another retail-related programme idea she could do worse than turn her attention to customer toilet facilities – celebrating the good and exposing the horrible. Customer loos are a staple of most department stores, and a necessity for those that have a restaurant or café. In the context of shops’ facilities increasingly taking the place of those that local councils once provided, many retailers do an admirable job. As you would expect, John Lewis’s toilets are usually spotless – resplendent with upmarket Dyson hand driers, and showing the attention to detail and superb customer service that has underpinned the recent success of the Partnership’s business. Given the high footfall, the big four supermarkets also do a pretty good job of providing facilities that are clean, pleasant and well equipped – the same qualities that you expect to find on the supermarket salesfloor. Alas, not all shops’ toilet facilities are, quite literally, as sparkling, particularly where stores are in older buildings or in need of a refit more generally. The example above – photographed yesterday – looks like a dodgy backstreet loo, but in fact it’s the gents’ customer toilets in House of Fraser in Darlington, serving both the restaurant and the wider store. 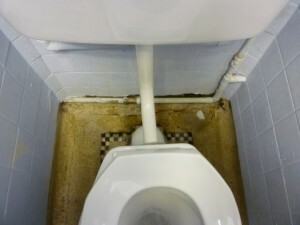 Let’s be clear – the state of a store’s toilets alone probably isn’t going to put a customer off going there to shop. However, grimy, unmodernised facilities aren’t what you expect to find in a department store that positions itself at the premium end of the market. By all means invest in celebrating the relaunch of Biba – but don’t forget the small, yet important, details that can impact negatively on your brand.